Naturally, the quarter-by-quarter-no-way-these-don’t-work-pies were currently being used by a few people in the room. I adjusted the wording from youth going to detention centers to youth being served so that this example is relevant to even more of you. 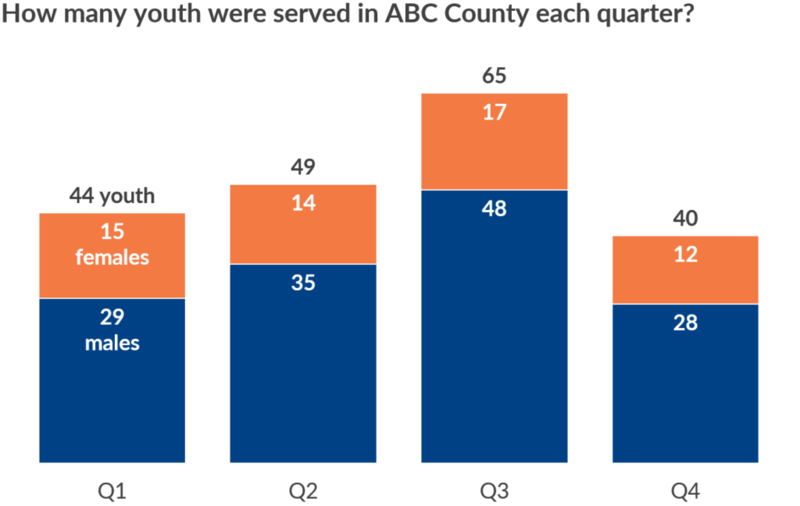 The quarter-by-quarter pies are off the table. According to my pie chart guidelines, gender breakdowns are one of the only times it’s okay to use a pie chart (nominal variable, just a few slices, etc.). But it’s really hard to make comparisons across multiple pies. Your eyes would have to jump from the 1st quarter pie to the 2nd quarter pie to the 3rd quarter pie to the 4th quarter pie and back again. I’m tired just thinking about it. After we sketched ideas and discussed the pros and cons of each approach, we decided that stacked bars with numbers were the most promising. Stacked bars can display the number of males, females, and the totals. They’re also easy to label (compared to, say, a stacked area chart). We used vertical bars because time is ordinal. My rule of thumb is to display numbers for anything less than 100 and percentages for anything over 100. 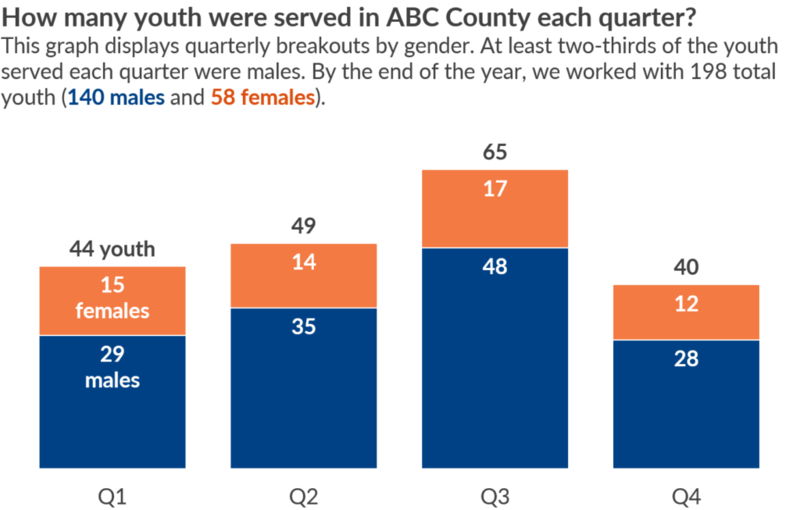 Fewer than 100 youth went to these detention centers each quarter, so we displayed numbers. Here’s the after version for a handout or report, which intentionally contains a bit more explanatory text. 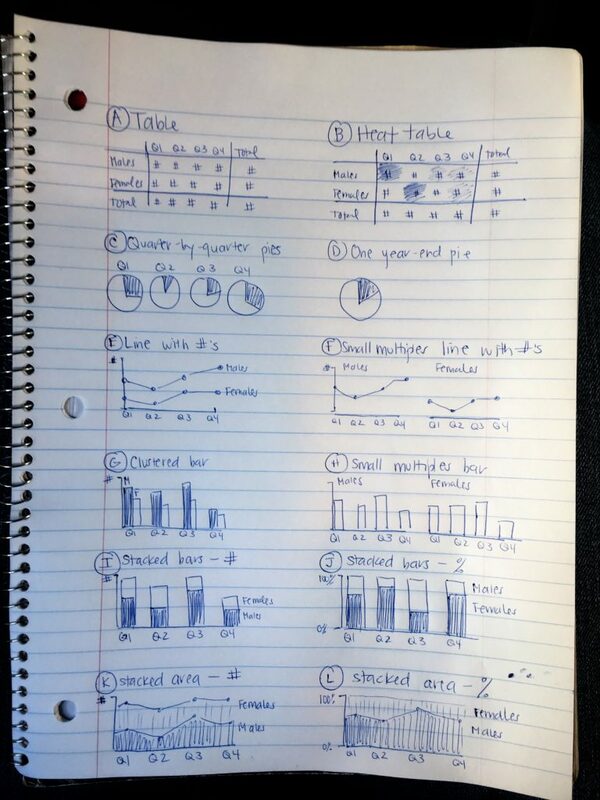 No, I didn’t add the totals to each quarter’s bar chart with text boxes. Yes, that’s possible. It’s also a ton of work to crunch the numbers, create text boxes, and center them perfectly above each bar. 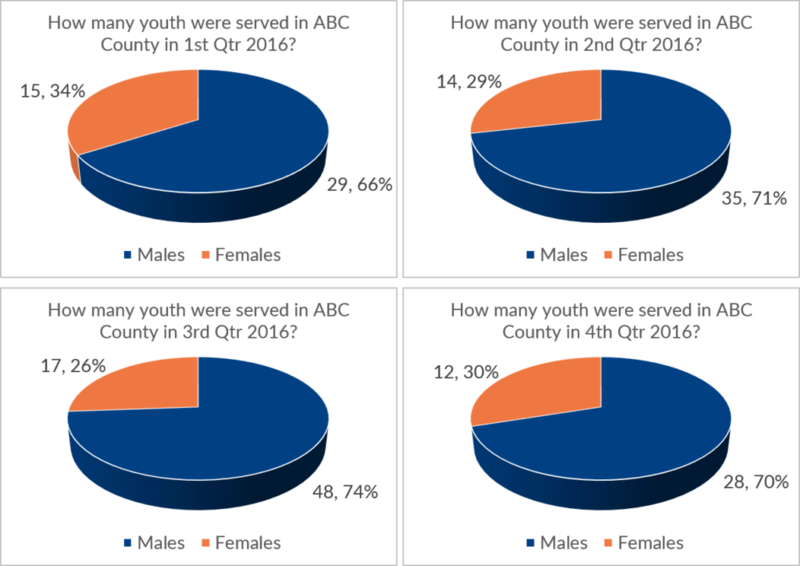 This is a stacked bar chart with three segments: males, females, and totals. The total segment has a transparent fill so it looks invisible. If you want to explore the strategy in more detail, watch the video or download the template.